Time: about 1 hour. Make the marmalade ahead so you can whip these babies out in just a few minutes. Leftover marmalade is terrific on pork chops and roast beef. Make marmalade: Melt butter with oil in a large heavy frying pan over medium-high heat. Add onions, garlic, sugar, salt, and pepper, stirring well to combine. Reduce heat to medium and cook, stirring occasionally, until onions have softened and browned, about 20 minutes. Add vinegar and wine. Cook, uncovered, stirring occasionally, until most of the liquid has been absorbed and onions are soft and sticky, about 10 minutes. Let marmalade cool slightly. Make sandwiches: Evenly spread one side of each bread slice with 1/2 tbsp. butter. Spread unbuttered side of 2 slices with 1 1/2 tbsp. marmalade each, then top with pastrami and cheese. 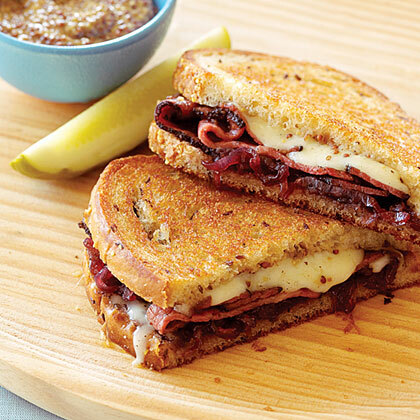 Spread mustard on unbuttered side of remaining 2 bread slices and place each, buttered side up, on pastrami- and cheese-topped slices. Heat a large nonstick frying pan over medium heat. Add sandwiches and cook, turning once, until golden brown on both sides and cheese is melted, about 5 minutes total. Make ahead: Marmalade keeps up to 2 weeks, covered and chilled.